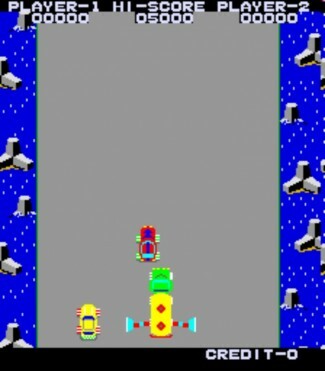 A driving game where you attempt to get to the finish line by dodging cars and jumping over the river and then pressing the brake button to stop the car. Race on several different international courses (first being “Asian Course” second being “American Course”, etc.) and attempt to land and stop on the island at the end of each course. Drive through the course and avoid hitting or bumping the other cars otherwise you will explode. You have infinite lives, but you lose fuel (a little for bumping the side of the course or about a square’s worth for hitting a car) and usually start again slightly behind where you crashed. Apparently the accelerator in your car is stuck since it will go to full speed all by itself unless you press the brake. Somewhere around halfway through the course a fuel truck will show up (as shown in the 3rd screen shot on this page). To refuel, all you have to do is make contact with either “arm” on the side of the truck (but do not hit the truck). When you are almost at the end of the course, you will see numbers on the track (80, 60, 40, 20, 00) showing how far until the road ends. You must jump before the 00 mark. When you land, apply the brakes and hope you can stop fast enough. If you do, it’s on to the next level. The game ends when you run out of fuel or if you crash in the water. The best way to refuel you car is to completely stop towards the bottom of the screen, then let the truck catch up to you, as soon as it does, release the brakes and you will speed up as fast as it does keeping you continually refuelling until the truck gets faster than you.